If this is your first time visiting the RideMax website, you should know that RideMax is planning software designed to save you time in line at Disneyland and Walt Disney World. You enter the date you’ll be visiting the park, as well as the attractions you want to visit, along with your preferred touring options. RideMax takes these into account, crunches on our estimated wait times for the date of your visit (possibly comparing *millions* of potential itineraries), to create a custom, optimized game plan which you can then take to the park. RideMax was initially released in the pre-smartphone days, when folks actually printed their RideMax plans on paper and took them to the park. Although you could still follow this procedure today, a lot of technology has been introduced since those early days which can assist the visitor to Disneyland and Walt Disney World. 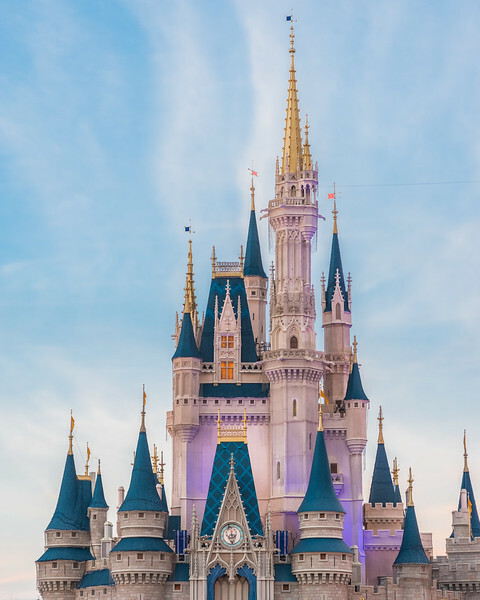 Some of these innovations include smartphones in general, FastPass+ at Walt Disney World, MaxPass at Disneyland, and the parks’ own apps, which give users insight into current wait times in the park. Third-party apps also abound. Given all of the tools available to theme park visitors these days, I thought it would be helpful to outline ten reasons why I STILL think you should be using RideMax to help plan your next Disney park visit. 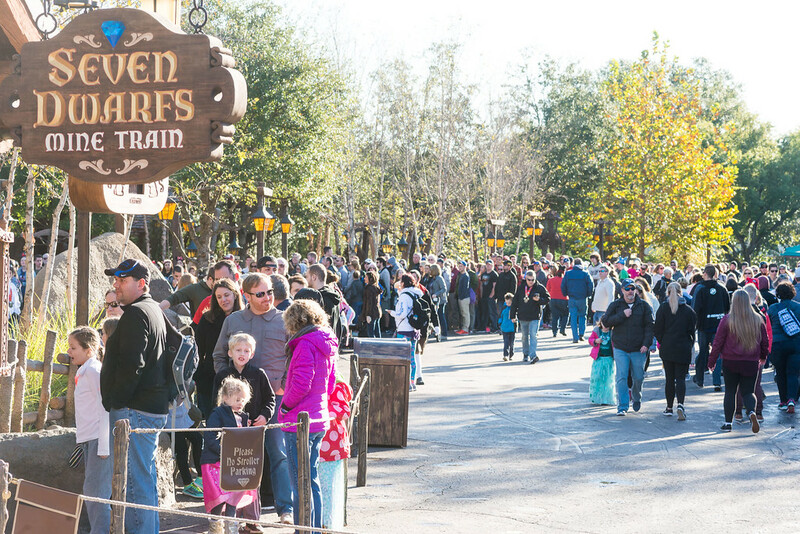 Crowds build early at the Seven Dwarfs Mine Train in the Magic Kingdom. A little strategy here can go a long way. So, how much is that time savings worth to you? Let’s assume for a moment that you are a family of four is planning a three-day visit to Disneyland, where you expect to spend an average of eight hours each day in the park, at a total cost of $2,000 for everything, including park tickets, hotel stay, and travel. If you divide that $2,000 by the 24 total hours you expect to spend in the park, you’ll see that the cost per hour of park time is just north of $83. At that rate, RideMax will only need to save you eleven minutes(!) in line before you break even on your $14.95 RideMax investment. And that’s not eleven minutes per day, but eleven minutes TOTAL for your entire vacation. We’ve had customers report saving HOURS of time in line thanks to RideMax, so this advantage seems pretty clear. One big hassle with FastPass+ at Walt Disney World is that until this month, guests were only allowed to make three FP+ reservations on their own — you had to visit an in-park kiosk once you used those first three if you wanted to schedule additional FP+ experiences. 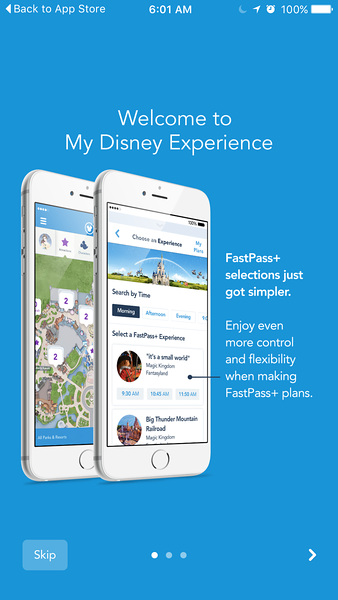 Well, Disney has just enhanced their iPhone and Android apps to allow guests to make their own fourth (and more) FastPass+ selections using a mobile device, rather than visiting an in-park kiosk. You have to make the additional reservations one at a time — and only after using your first three — but for those who end up using this feature, it holds some hope of cutting down on the hassle we saw in my previous post with insane lines at the FastPass+ kiosks during spring break. I downloaded the new version of the app to my iPhone and gave the feature a whirl last Monday, April 11th. Before I begin, I will note that the week of April 11th saw much lower crowds than the week before, as the “Easter rush” had sort of died down a bit by then. 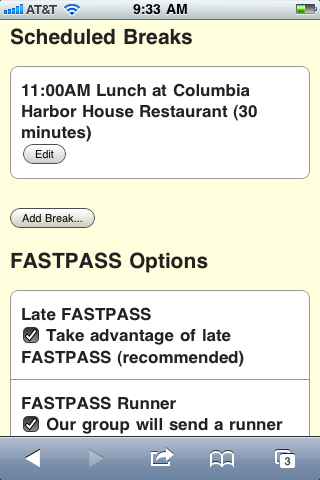 New RideMax FASTPASS Features Added to Web Version! Just in time for fall break, we’ve added two significant new features to the web version of RideMax, both of them related to FastPass. The ability to specify whether you want your RideMax plans to take advantage of FastPass or not (see below for why this might be useful). For plans using a FastPass runner, the ability to tell RideMax which specific attractions the runner is willing to skip, if any. 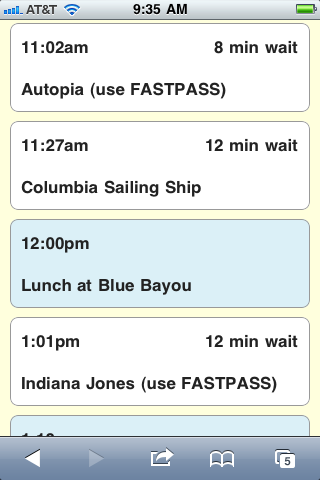 Related to the first feature, you might wonder why someone might want to NOT use FastPass. This really is in anticipation of the new FastPass-Plus (FP+) system at Walt Disney World, which is currently in testing mode throughout the Walt Disney World parks. Note that if someone is testing the new FP+ system and ALSO wants to use traditional FastPass, this customer can simply leave the “Use FastPass” checkbox selected in RideMax, AND add scheduled breaks to the plan for the FP+ reservations, and go from there. So either way, RideMax has you covered. As I’ve noted above, the second feature we’ve added allows someone to specify which attractions the FP runner is willing to skip, if any, while off running around gathering FP tickets for the rest of the group. This is a feature which is already included in the Windows version, but we felt it was time for the web version to gain this functionality as well, as this can be a very useful tool in planning the day. And, just to be clear, these new features have been added to both the desktop-based web browser AND the mobile web browser versions of RideMax. There has also been a bug in the mobile web version of RideMax that prevented someone from adding more than one scheduled break to a plan when creating the plan using Safari on the iPhone, and possibly from other browsers as well. This bug is now fixed with this update. With fall break just around the corner, I’m hoping you find these new FastPass features, as well as the recently-added support for shows in the Disneyland version of RideMax, helpful in planning your visit! Author Mark WintersPosted on October 7, 2013 Categories Disneyland, FASTPASS, Mobile, RideMax, Walt Disney World5 Comments on New RideMax FASTPASS Features Added to Web Version! New RideMax Version for iPhone, Android, and Mac! We’re excited to announce a new web-based version of RideMax that works great on iPhone, iPad, Android, and Mac systems! Access to this mobile beta is free to RideMax subscribers. Your RideMax plan in a nice portable format for display on iPhone and Android devices! This new version of RideMax is in “beta” mode right now (which means we’re still testing it and improving it before final release) but even in it’s current “unfinished” state, it’s very usable, and provides new capabilities to the RideMax system as well! Many customization options included. Add up to five breaks and decide how you want to utilize FastPass! Create and view your RideMax plans right on your mobile device or web browser. RideMax now saves your plans for later use. Create a plan using a standard web browser and view it later on your mobile device, or vice-versa! Add up to FIVE breaks to your plan for meals or other activities. Report wait times to RideMax. More wait time data allows us to improve the RideMax estimates over time. 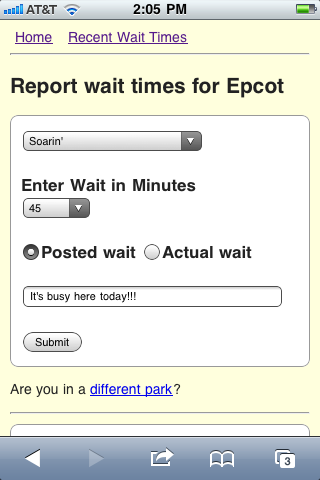 While in the park, report wait times! Q: I just subscribed to your service. How do I access the new beta version on my iPhone, Android, or iPad? A: When you subscribed, your download instructions contain a link you can use to activate the beta. Click on this link, choose a username and password, then point your mobile web browser to http://ridemax.com/webapp. Now sign in with the username and password you just selected and start planning! Q: Will RideMax work on my particular mobile device? What devices are supported? A: Given the number of mobile device models being produced these days, it’s impractical to test RideMax on all of them. We’ve done extensive work with RideMax on iPhone, and though we haven’t tested it extensively on other systems, it also seems to work on some other mobile “touch-screen” browsers that are based on newer versions of WebKit, such as that found in newer Android models. We’ve also had specific customer reports that RideMax runs on the Motorola Cliq and the HTC EVO, but that it does not work on Windows Mobile devices. We had one Blackberry customer report success, but that was on a very new touch-screen model device, and we don’t believe it will work on the “click-based” Blackberries that are still fairly popular. Q: What are the pros and cons of using the mobile or web-based version rather than the Windows version of Ridemax? A: One advantage of the web/mobile version is the ability to modify your plans right from the web or a mobile device. No more need to take the laptop on vacation just to access RideMax! Another advantage is that you don’t need to carry a paper plan with you if you have access to RideMax on your mobile device. With a mobile device, you can also share wait time information and comments with us. This allows us to improve the RideMax estimates further. A disadvantage of the mobile version is that it’s still in “beta” mode — meaning that it’s incomplete and some of the formatting is less than ideal. Most of the “tips” still need to be added as well. Q: Aren’t there lower-cost applications for the iPhone and Android that work just as well as RideMax does? Why do I need this? A: It’s true that there are “wait-time apps” produced by others, but sometimes you get what you pay for! Planning in advance — not just supplying current wait times — is a RideMax specialty, and in our opinion, this is vital to minimizing your overall wait, especially when the park is busy. Does it really help you to know that right now the wait for Indiana Jones is 60 minutes rather than 90? Either way, you don’t want to stand in that line, right? What you really need is help avoiding that 60-minute-long line, and that’s what RideMax is designed to do! Take a look at how much you’re spending on your Disney vacation, and we think you’ll agree, the cost of RideMax is tiny by comparison. 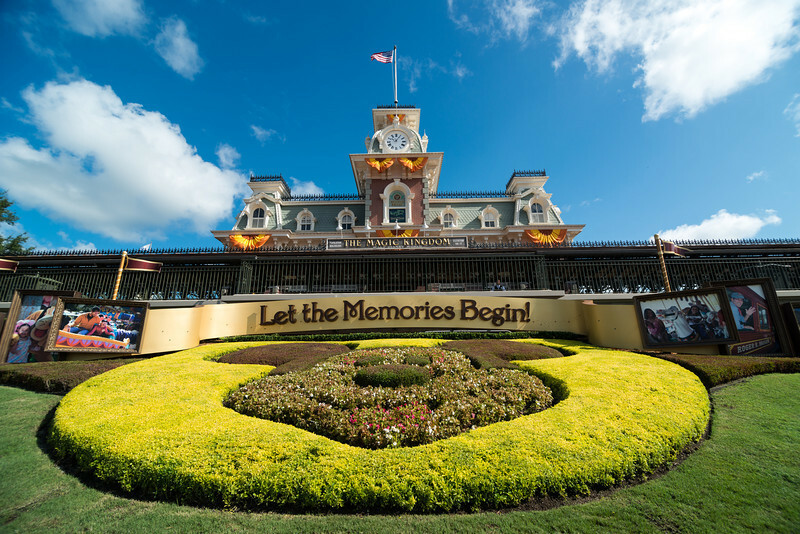 This summer we celebrate our 10th anniversary of providing customized itineraries for Disney theme park customers. Why take a chance with some random iPhone wait-time app, when you could be using RideMax instead? Author Mark WintersPosted on May 19, 2011 March 31, 2012 Categories Disneyland, Mobile, RideMax, Walt Disney World17 Comments on New RideMax Version for iPhone, Android, and Mac! Disneyland’s MaxPass Popularity: An Upward Trend? Animal Kingdom RideMax Plans? It’s Time to Recalculate! Crunching the Numbers: How Popular is Disneyland’s MaxPass System? DCA Construction – Update those RideMax Plans! Disneyland’s MaxPass: Is It Worth It? Brent on Animal Kingdom RideMax Plans? It’s Time to Recalculate! Mark Winters on Crunching the Numbers: How Popular is Disneyland’s MaxPass System? Marie on Crunching the Numbers: How Popular is Disneyland’s MaxPass System? MikeDemo on Crunching the Numbers: How Popular is Disneyland’s MaxPass System?